The Premium Bond Bags pattern is a 1950's vintage inspired purse with a flat base, darted external and internal pockets, and 2 shoulder straps. 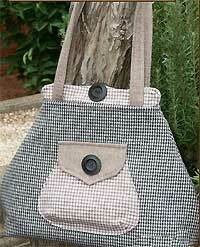 There are 2 different styles included in this pattern - one with a unique upturned tab and the other with a button trimmed front flap. Finished size is 17" W x 13" H x 5" D.